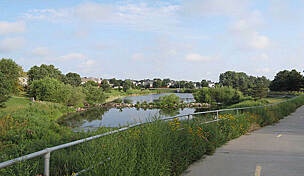 The Blue River Rail Trail meanders along the course of the Big Blue River, in places meeting the water's edge and in other places straying from its banks. 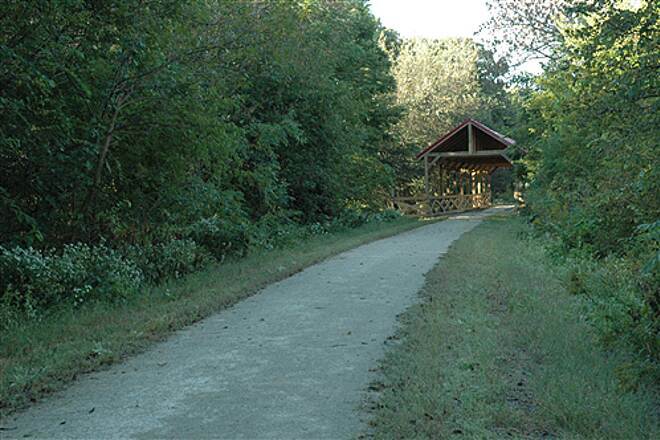 The rail-trail stretches between Marysville and the Nebraska state line, where it meets the Chief Standing Bear Trail. 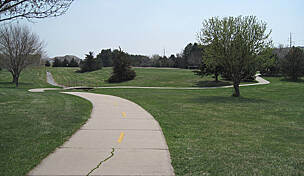 That trail continues north on the same former rail corridor to Beatrice, where it seamlessly meets the Homestead Trail. 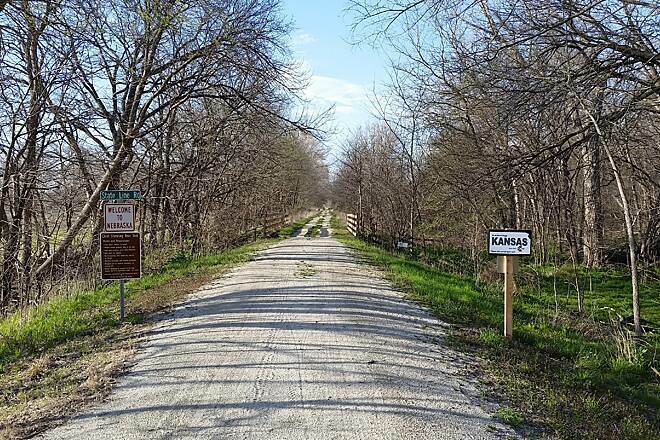 These three trails—plus the Jamaica North Trail beginning in Saltillo, Nebraska—combine to form a spectacular uninterrupted route from Marysville, Kansas, all the way to Lincoln, Nebraska. 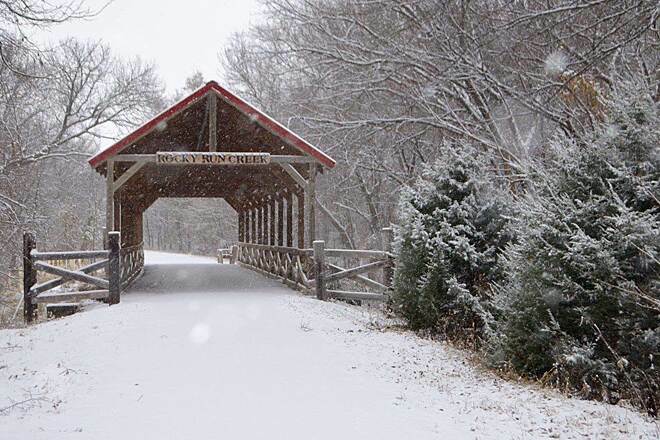 The crushed-limestone Blue River Rail Trail passes among farmland and includes pleasant river views, wooded stretches, a covered bridge and limestone cliffs. Between Harvest Road and Frontier Road—a 2.9-mile segment—you'll encounter a canyon with 20-foot walls and a bridge offering more scenic views of the cliffs and roiling tributary of the Big Blue River. 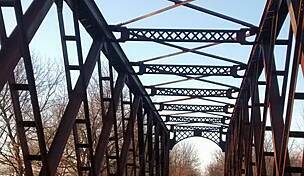 Another highlight occurs between Frontier Road and Deer Trail Road (in the farming village of Marietta), where the trail crosses a restored trestle with a steel-grid walkway. 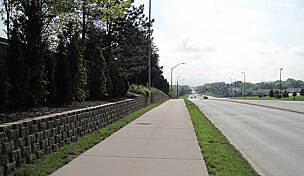 A disconnected, concrete-surfaced section of the trail runs on the same former rail corridor farther south through the heart of Marysville. 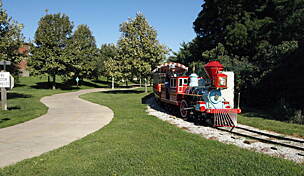 A highlight is the Pony Express monument at the segment's northern end, honoring Marysville's station on the original route of the early mail service. Be sure to check out the quaint shops on Broadway Street as well. 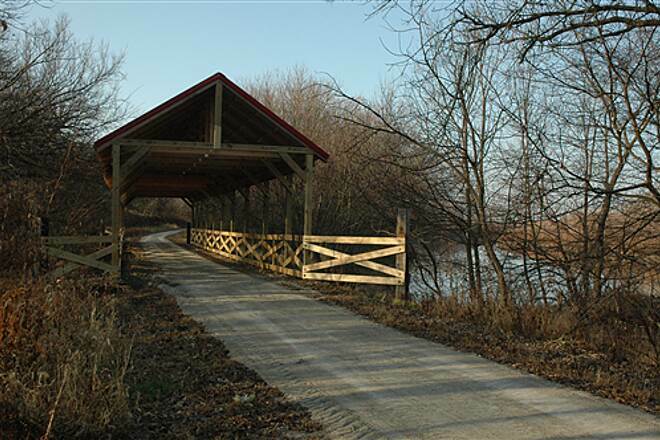 To access the Blue River Rail Trail, you can park at the following locations where the trail intersects the roads: Jayhawk Road and Harvest Road in Marysville; Frontier Road in Hull; Deer Trail Road in Marietta; and Mill Street in Oketo. Parking for the paved southern segment in Marysville is available adjacent to the trail between Broadway Street and Elm Street. Nice ride with abundant shade in the morning. We had a good day on the trail in May. Saw deer, garter snakes, and redwing blackbirds. Love their song! 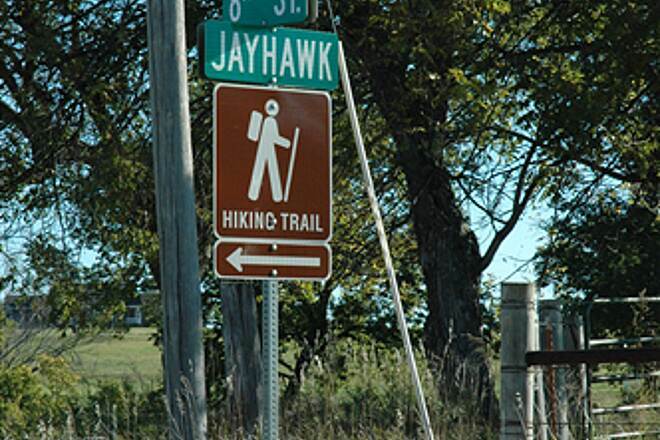 Just wish there was a restroom facility at the Jayhawk Trailhead. We're in our 60s and look for trails where we can park our car safely, bike 20-40 miles to a place where we can stay comfortably, then return the next day. 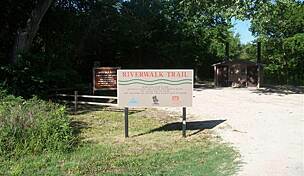 The Blue River Trail, in combination with the Chief Standing Bear Trail of Nebraska gave us such an experience, one way distance of about 38 miles. (See our review of that trail also.) 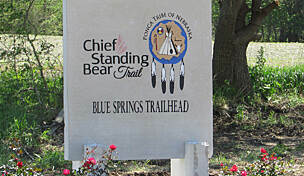 We elected to start in Marysville KS on a warm summer day, and go to the end of Standing Bear trail in Beatrice NE. Both cities have nice variety of services for the tourist. Blue River trail has excellent surface conditions, good vegetation control, safe bridges, mileage markers and minimal inclines. The Blue River Trail passes through a nice variety of open space and deep shade, but has no water/restrooms, or towns for services on the way. 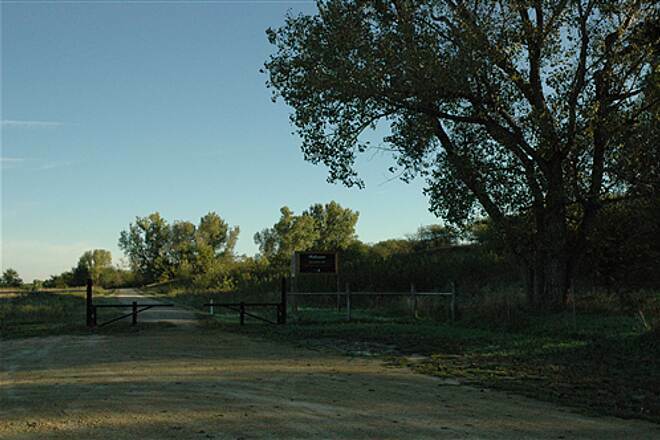 There are limited services on the Chief Standing Bear Trail after you get into Nebraska. Good wildflower and wildlife trail, bring plenty of water and hats/sunscreen. Love to go out on this trail and just ride! plenty long for walks or bike rides. Really neat that it hits the Kansas/Nebraska border! Rode from Marysville to Barneston, NE (so, 3 miles on the Chief Standing Bear trail) and back on Labor Day. Trail is in excellent shape. Great scenery; lots of turkey, a couple deer, friendly people. Rode this trail from Marysville to the north side of Lincoln last Saturday (8/27/16). It was great! 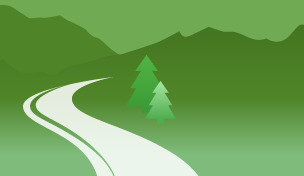 85 miles of mostly tree-lined trails. Saw lots of deer, turkey, coyotes, and quail. Hardly saw another person, except for a few people close to Beatrice and Lincoln. There are few towns, especially between Marysville and Beatrice, so you need to be self supported. It is a fairly smooth trail, but I would only use puncture resistant, self-sealing tires since you will be a long way from help if you can't fix a flat or have problems. 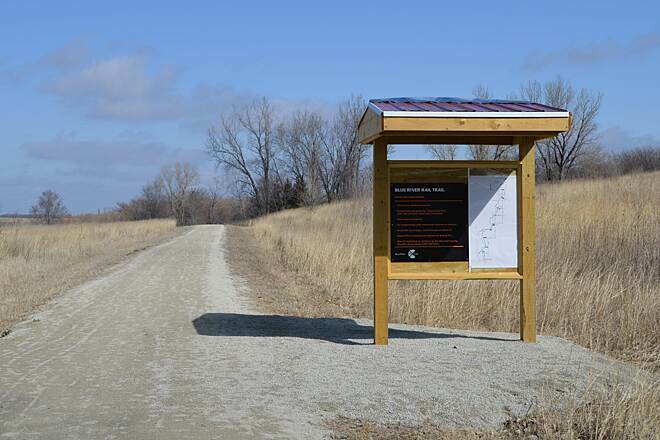 The new trail from the Nebraska line to Beatrice have nice trailheads with water and bathrooms that are just being completed. 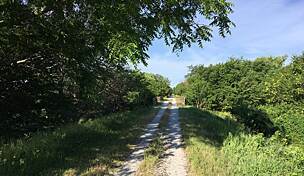 While in Marysville, KS to watch the Pony Express 2016 Re-Create, I discovered the Blue River Trail and walked both ends of the trail but not the middle section due to a lack of parking access. Contrary to the Trail Description, there is NO parking at Frontier Road, only a sign on a gated lane that says "No trail access" and a private home and drive with a person who does not seem trail friendly as he gazes out the window to make sure you don't park there. 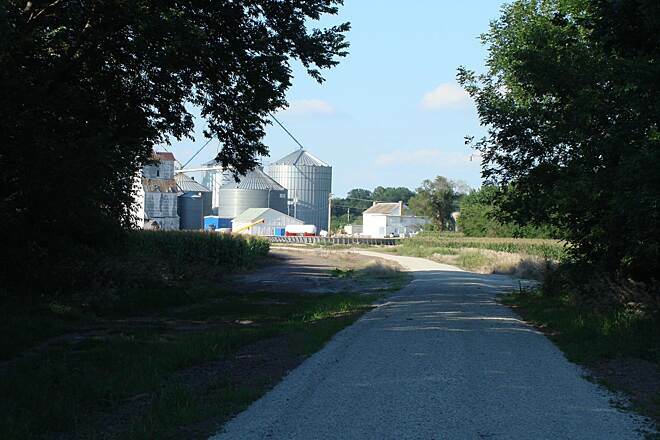 It may be possible to park at Harvest Road, but there is certainly not a lot that is designated trail parking, only a pull off area that seems to be private access to farm silos so be very careful not to block access to farm machinery if you park here. I chose not to at all. There is a nice parking lot at Jayhawk Trailhead, and adequate parking that felt safe and welcoming enough at Deer Trail Road in Marietta. There is room for a car or two at Mill Street in Oketo. There is no water or facilities along this trail and some of the trail is exposed to full sun so be sure to carry plenty. The northern section was mostly shaded. There are almost no houses along this trail and there were very few other hikers/bicyclists during my several hours on the trail on a summer weekend. 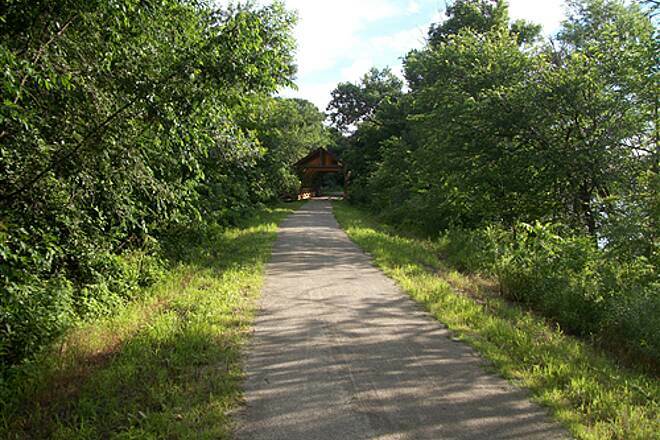 Trail is well maintained and a very pleasant walk. Thank you to those responsible for this nice trail. I rode this trail from the NE border to Marysville and back in early June, 2016 as part of an out-and-back three day ride south of Lincoln. The entire length is packed gravel, making for excellent riding conditions. There are mileage markers every half mile along this entire stretch. Services are non-existent the entire length of this trail. From the S end of the trail, it's two miles to Marysville. There's a sandwich shop at 8th and Broadway, but it's closed on Sundays. I refueled at the convenience store between 4th and 5th and Broadway. In three days of biking this and three other connected trails, I saw less than three dozen people. 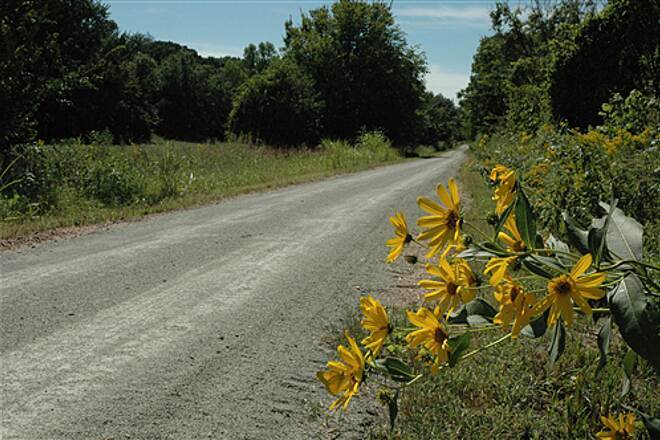 I thoroughly enjoyed cycling the Blue River Rail Trail from Marysville Kansas to the Nebraska line and back. I rode in mid-December and had the trail to myself. It was probably 40 degrees and there was a pretty stiff north wind, but it took nothing away from the enjoyment. The base is crushed limestone and allows you to ride on whatever type of bike you choose. I rode on a hardtail, but my Kona Rove with 28mm would have been at home on the trail as well. I would also consider riding on a fatbike, especially after a snowfall. The trail follows an abandoned railroad bed, and so it's flat. 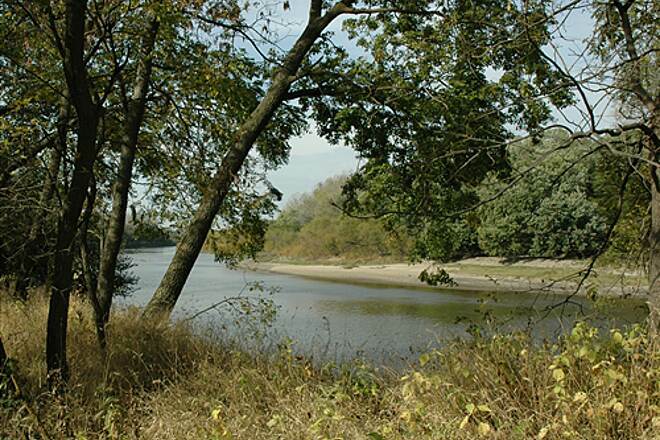 Because it's mostly in the Blue River bottomlands, the terrain surrounding the trail is varied. There are farm fields, woodlands, even limestone outcroppings. It's very scenic. 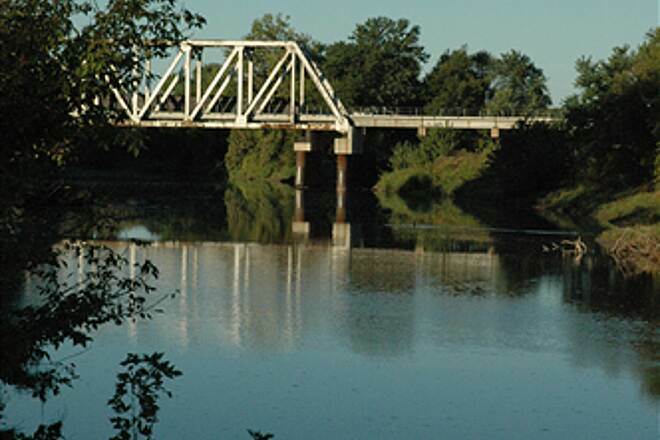 Be sure to save a little time and explore the town of Marysville with it's quaint downtown. I didn't really have any expectations coming into this trail, but I was hugely surprised by how well maintained it was and the interesting path that it took. It crosses over some old railway bridges from the 1800s which I found to be really interesting, and also has a nice mix of wooded areas and open areas. Very highly recommend! I like to check in on this trail every six months or so. 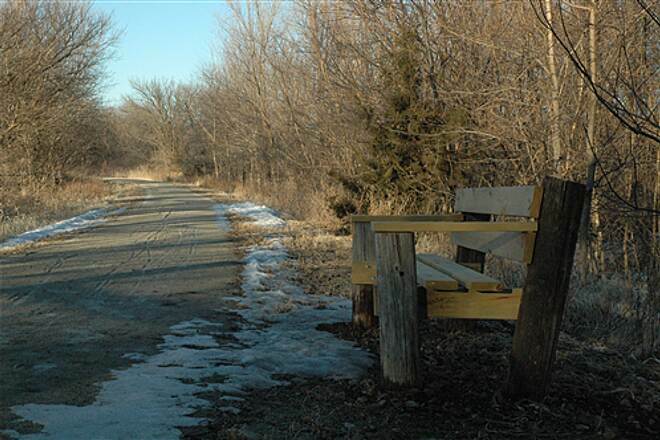 It has made a lot of progress in that time, with more benches and bridges than before. Certainly worth checking out if you happen to be in the area! This 11.5 mile trail is nearly completed. No more railroad ballast to worry about! 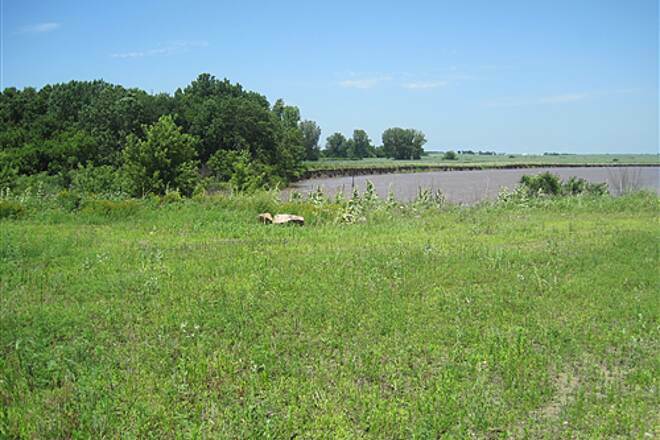 The scenery is beautiful - with views of the river, limestone canyon walls, corn fields and lots of shade. Beautiful to walk, run or bike. Thoroughly enjoy it! 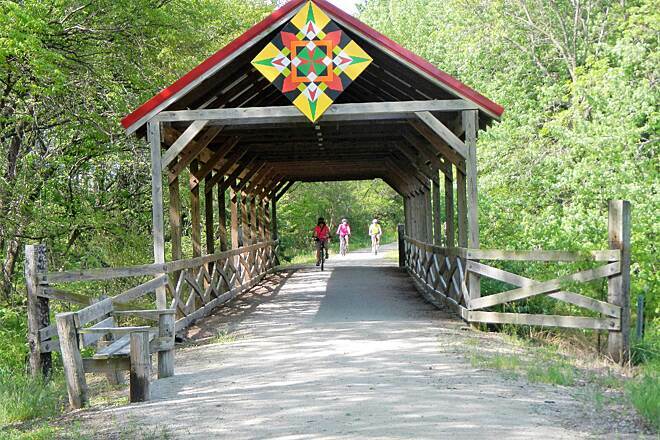 The Blue River Rail Trail is a hidden treasure for Marysville. I rode the trail 8 miles today and loved every minute of it. The scenery is absolutely beautiful!!! Thanks to all who have made this possible. 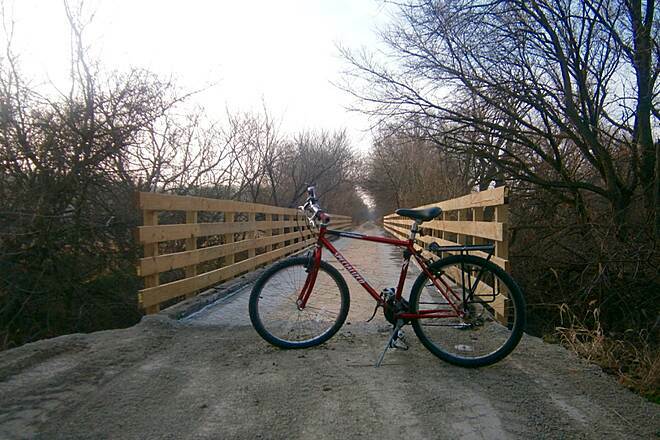 05/17/13 trail is only 5 miles long for biking, after that the gravel is too large to safely ride on. not worth a long drive to get there. scenery is so so and could not find a current up date on the trail length. A very enjoyable ride, on May 15, 2013. I rode it as an out-n-back, starting from and returning to Oketo, Kansas. I don't recommend that, since it means the first three and last three miles of the ride are on railbed ballast and most uncomfortable to ride on. Instead, start at Marysville and ride as far as the Frontier Road trail head. 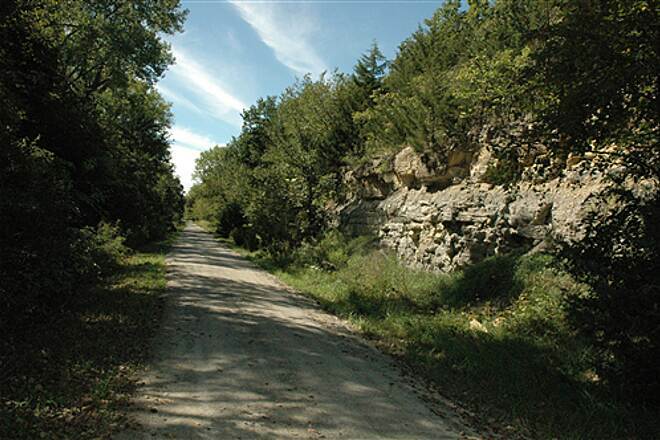 The trail is smooth crushed limestone with no hills or bumps, and occasional views of the river to the west of the trail. I was pleased to note that work is being done on the unfinished portion of the trail. A great deal of brush and undergrowth have been recently been cut and moved off the trail, and I would expect that the ballast will be removed or covered over soon. 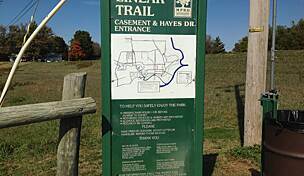 I look forward to the completion of this trail and its eventual connection with the Homestead(?) Trail in Beatrice, NE.